Villain stories are, I think, inherently difficult. Readers, as a construct, almost always root for the heroine. And why not? She’s inherently good: righting wrongs, battling monsters, usurping despots. She has killer talents: swordplay, magic, leadership. And because fantasy literature is so often aspirational, you know she’s going to prevail. Regardless of whether readers see themselves as the heroines of their own stories, almost everyone wants to take an hour or three to lead the life they would live if they were the heroine of someone else’s. But hardly anyone envisions themself the villain. A villain story is, by definition, about the bad guy. Otherwise, the villain wouldn’t be a villain at all, of course, but a deeply conflicted heroine or even an antiheroine. By framing a villain story as a villain story, all the writer has done is cast the villain as the protagonist. The framing itself—good vs. evil, or in this case, the people who eat the hearts of living things vs. those who don’t—remains the same. And the villain is, by definition, on the opposite side of that line from the reader. A reader who, again almost by definition, is rooting for someone else. To complicate matters further, the question of what makes a woman a villain is deeply conflicting. So often, far too often—especially in young-adult works about female villains—the primary traits that cast the protagonist as a villain are those same traits that we teach young women are profoundly unattractive: rage, ambition, unlikeability, a desire for power, aging. Think back to your fairy tales: How many of those princesses actually sought their power? Craved it? Or alternately, how many were crowned almost accidentally: a fairy godmother and a shoe; an unbidden kiss in the woods; a forbidden curiosity about life on land. What makes a female villain is so often, far too often, a refusal to conform to what society demands: silence, passivity, youth. Which of course raises the necessary question: Are those women even villains at all? 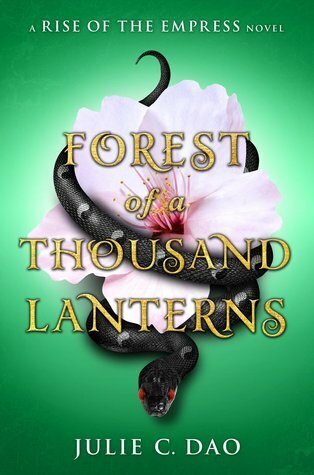 All of which is to say that Forest of a Thousand Lanterns—a retold tale about the rise of the evil queen in Snow White—had a long row to hoe. Xifeng—our protagonist, but not our heroine—is beautiful. Impossibly beautiful. The sort of beautiful that attracts stares from passersby and commands the attention of the manly Wei, her town’s apprentice blacksmith and amateur swordsman, and eventually will draw the notice of the Emperor. As you might expect in an Evil Queen origin story, much is made of Xifeng’s beauty, both to the reader and to Xifeng herself. Xifeng lives with her aunt, a power-hungry, magic-practicing village crone named Guma. Guma abuses Xifeng, both emotionally and physically (though always avoiding her face). She’s convinced Xifeng, through blood magic and fortune-telling, that Xifeng is destined to be Empress, so long as she’s willing to sacrifice enough. What Forest of a Thousand Lanterns never makes quite clear, though, is how inevitable this portent is. Are the cards simply showing the future? Are they showing but one possibility among many? Are they a manipulation of the gods? Are they a trick of Guma’s to bring her niece in line with her lust for power? Is Xifeng a tool—of fate or the gods or her aunt—or is she the master of her own future? Is she merely stepping along the path to her destiny, or making decisions that help her achieve her goal? One hopes for the latter, if only for the sake of agency, but fears that it’s the former, which lends the book an air of plodding inevitability. Did you really think that Xifeng wouldn’t become Empress? After years of abuse from her aunt, the catalyst for Xifeng’s finally agreeing to flee with Wei is that Guma strikes her face. Something that perhaps Xifeng and this particular retold tale itself take as a greater affront than a different circumstance might warrant, but that, as written, after years of abuse, lacks gravity. Similarly, after years of avoiding Guma’s bloody brand of magic, Xifeng’s catalyst for finally overcoming her squeamishness is, of course, to fix the mark that Guma left on her face. At this point, with the amount of obsessing over a scar, one perhaps longs for an Evil Queen origin story that, for a number of reasons—including, not inconsequentially, a deconstruction of what it means to be beautiful—doesn’t rely quite so heavily on a perfect face. Beauty is frequently a weapon, of course: a distraction, a tactic, an enticement. Both before and after she reaches the imperial palace, Xifeng uses her beauty as all three. But the lack of attention paid to the underlying societal expectations of beauty, especially young women’s beauty, leaves Xifeng something of a silly girl who is willing to eat hearts to maintain her pretty face—and we’re left wondering if, after all this time, a pretty face is still the only way for a woman to get what she wants. Who is the fairest of them all, indeed? Amy Tenbrink spends her days handling strategic and intellectual property transactions as an executive vice president for a major media company. Her nights and weekends over the last twenty-five years have involved managing a wide variety of events, including theatrical productions, marching band shows, sporting events, and interdisciplinary conferences. Most recently, she has organized three Harry Potter conferences (The Witching Hour, in Salem, Massachusetts; Phoenix Rising, in the French Quarter of New Orleans; and Terminus, in downtown Chicago) and eight years of Sirens. Her experience includes all aspects of event planning, from logistics and marketing to legal consulting and budget management, and she holds degrees with honors from both the University of Southern California’s Thornton School of Music and the Georgetown University Law Center. She likes nothing so much as monster girls, Weasleys, and a well-planned revolution.